Gripper pads for nonwoven surface conditioning (SCD) discs. 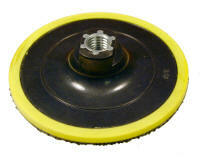 Use these pads to hold discs like 3M® Scotch Brite, Norton Beartex®, or our own high quality nonwoven abrasive brand. They have an extra long T hook that is designed to hold nonwoven nylon discs.